Should Apple's invention come to pass, your clothing might keep tabs on your health and be the communications bridge between all of the Apple devices that you carry on your person. People who carry around multiple devices on a daily basis sometimes have to connect the items together, but while wireless connections like Bluetooth could be used, a more physical connection could be warranted. This could be solved with physical cables making the connection, but this may be untidy for some people, as it could leave wiring in view. Sufficiently being able to hide the cabling could also lead to the prospect of new smart clothing designs, ones that do not need to cover a cable as part of a seam or to include extra holes to allow cables to pass through. There is even the possibility of clothing becoming a device itself, with embedded components like health monitors and displays that aren't obviously connected to other elements. It is also relatively difficult to incorporate electrical components into fabric-based items, due to being flexible and hard for mounting rigid structures to securely. 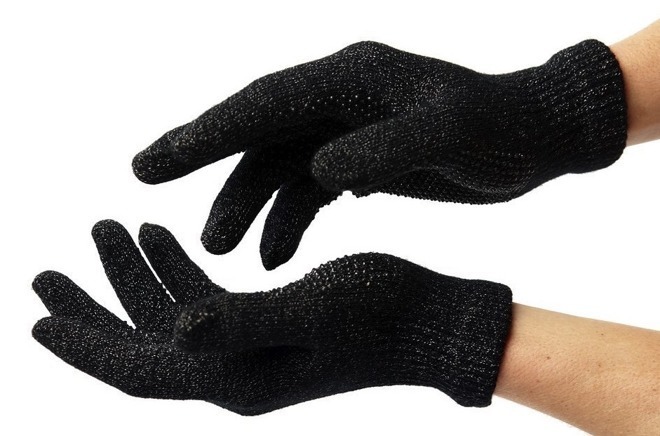 To a point, the use of electrically-compatible fabrics is already in use, but largely in the form of gloves that work with touchscreens. Apple believes that the concept can go a lot further than at present. A patent application from Apple published by the United States Patent and Trademark Office on Thursday titled "Fabric with Embedded Electrical Components" attempts to work around the problem by describing how fabric-based items could be created, with the fabric itself being the connectivity method. The core of the idea resides with the fabric, in that it is woven together with conductive and insulating yarns. The conductive yarns reside in the inner layers of the weave, while the insulating yarns on the outside prevent any undue contact with the conductive versions. The conductive yarns serve to provide a connection between multiple points on a piece of fabric, and can be set to run in specific conductive paths in the fabric's creation. To enable items to pass electrical signals through the conductive yarn, it can be exposed at specific points by bringing the yarn to an upper or lower layer for parts of the weaving process, before burying it back into the middle. The end result is for the creation of a fabric that acts like any other, but with the "wiring" incorporated to a level where it isn't detectable. These exposed elements can be used with an interposer that in turn is used with other traditional electronic components, including sensors, contacts, and output devices. 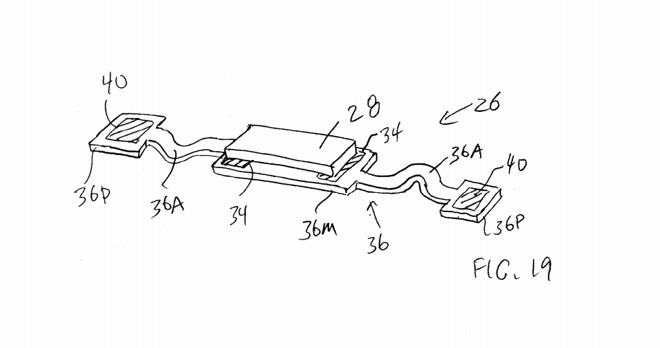 Since the interposer could be a flexible printed circuit substrate, and could have "serpentine arms" to help maintain connectivity with other components, this would be a more appropriate mounting point for other hardware. A concept of a flexible interposer with "serpentine arms"
Apple could use the proposed technique in a number of ways, such as producing clothing that connects with its products, like a headband containing health tracking sensors, or a hat capable of playing music through built-in earphones. The application also suggests the use of displays and LEDs, which could lead to users being presented with information without needing to look at their mobile devices. The woven conductive yarn concept could also be used in manufacturing, as a way of connecting together components in a flexible device, like a folding smartphone. 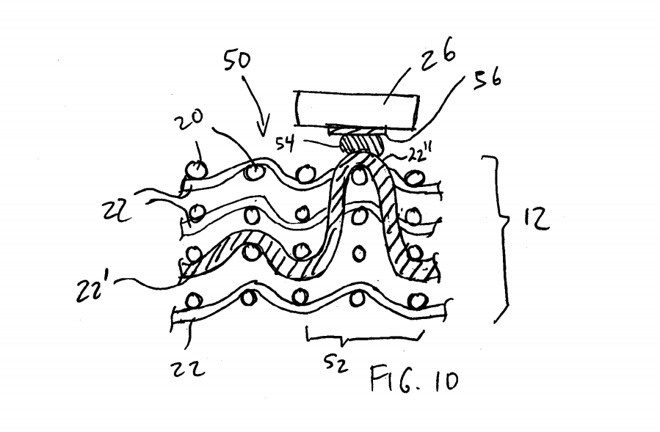 Apple has looked into other ways for components to communicate in fabric-like mediums, including one patent granted in July that uses stretchy and deformable elastomeric substrates as a form of circuit board. The components themselves also ideally need to have fabric-like elements, or at least to lean in that sort of direction. Such a system could be used with flexible displays, another area of Apple's interest, with Apple previously examining the use of flexible OLEDs and investing heavily in MicroLED technology. There is also the possibility of using the technology to augment the Apple Watch, by using it for the bands. Apple has looked into making the bands glow with light tubes, incorporate a camera, add extra indicators, and other elements that can all take advantage of fabric-based wiring. Oh boy. I think Apple is desperate on finding some innovation. That is getting weird by day. Entering clinical monitoring space? Medical equipment? Good luck with that. Nothing more restricted (except military) by regulations than this. Been there long time ago. This is what investors don't understand about Apple. We may have reached "peak iPhone." However we aren't even at the crawling stage of health products. There is a lot of money yet to be made. The value of Apple now is similar to the value of Apple back in the late 90's when I bought shares for $20. Having specific conductive paths could be problematic if the fabric is torn in the wrong spot. Better to use it as an electrical bus/plane that any electronic component can tap into the at any location on the fabric simply by pinning it to the clothing. Comms as well as power could be provided. The design team might be better off doing research focused on synthetic electrically conductive materials that have the same thermal and elastomeric properties as nylon or cotton and can be washable. Trying to weave classic electrically conductive wires into cotton or nylon seems unnecessarily complex. Not sure if sarcastic but if Apple gets into medical they could see a new iPhone-like revenue driver.